The Orchids is an outstanding property, beautifully and stylishly presented, it makes a fabulous base for a family holiday or equally for a couple or a group of friends. 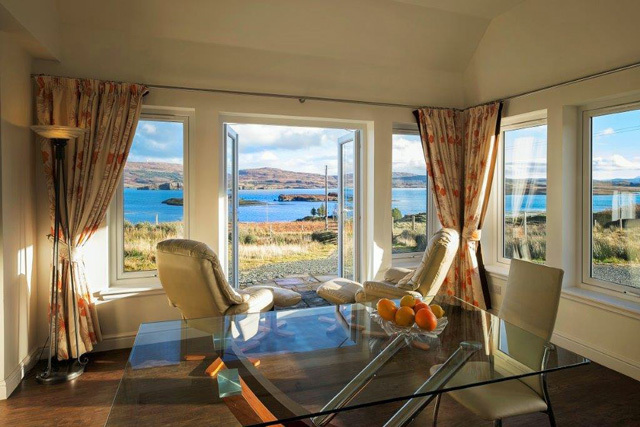 Location wise the house is ideal for exploring the north-west corner of the island, however you may prefer just to sit and relax and enjoy the far reaching views across Dunvegan Bay to Dunvegan Castle and to the Cuillin mountains in the south. Inside The Orchids has been equipped and furnished to an extremely high standard, the personal style of the owner being in evidence throughout. 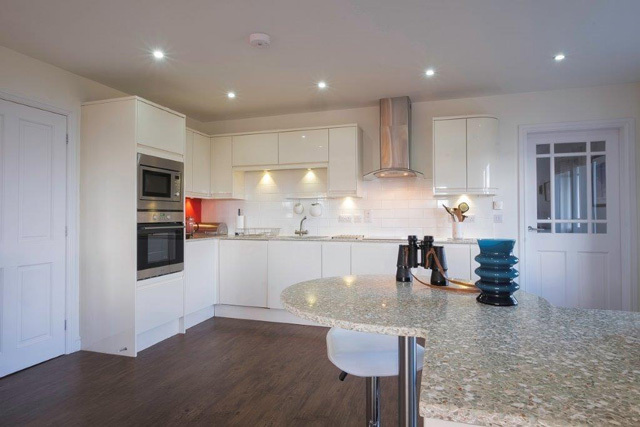 On the ground floor, on one side of the property the open plan kitchen and dining area has been designed to take full advantage of the magnificent views. 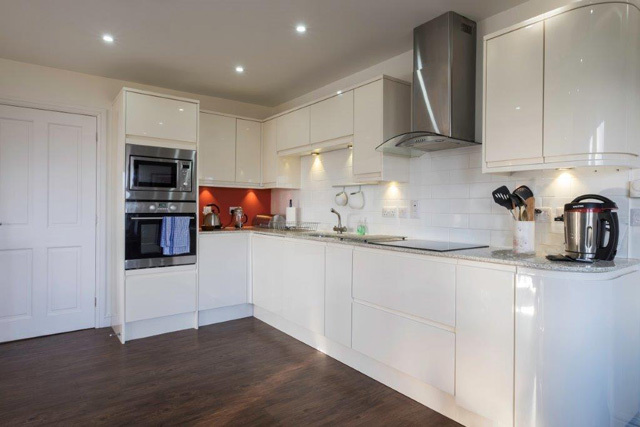 The kitchen has all the usual appliances and a utility room is also located to the rear. The dining room has a large table and seating for six, and also offers direct access to the garden. To the other side of the property the lounge can be found, furnished with a leather sofa and armchairs, this room also benefits from outstanding views. The property has three bedrooms, the first of which is located on this level. 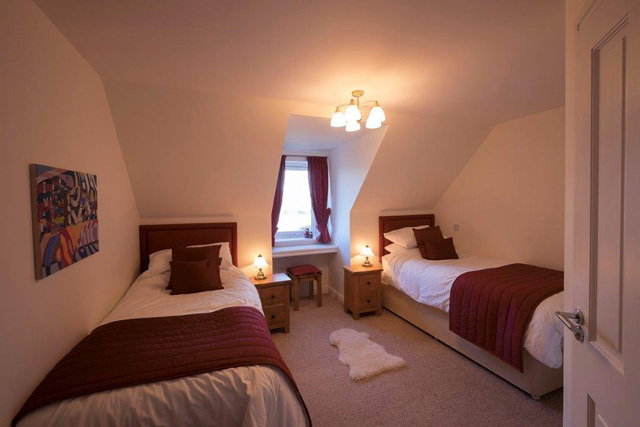 This room located to the rear of the property has a king size bed, and an adjacent shower room with a large walk in shower. From the lounge the stairs lead to the upper level and the additional bedrooms. 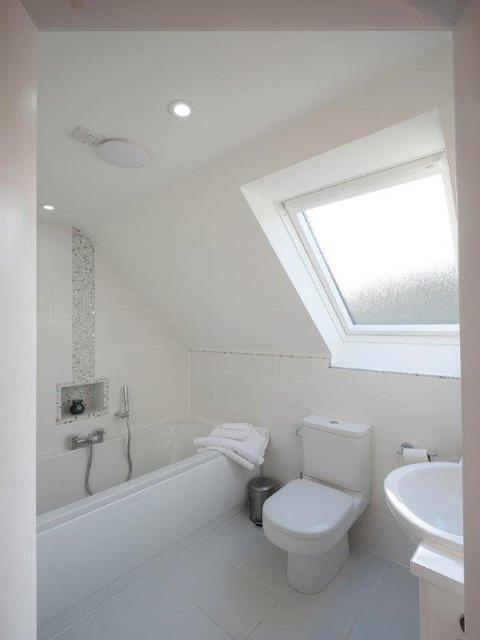 The bedrooms on this level have en-suites, the master bedroom has a super king, and an en-suite shower room, and the twin an en-suite bathroom. Both bedrooms are front facing and again benefit from having the views. 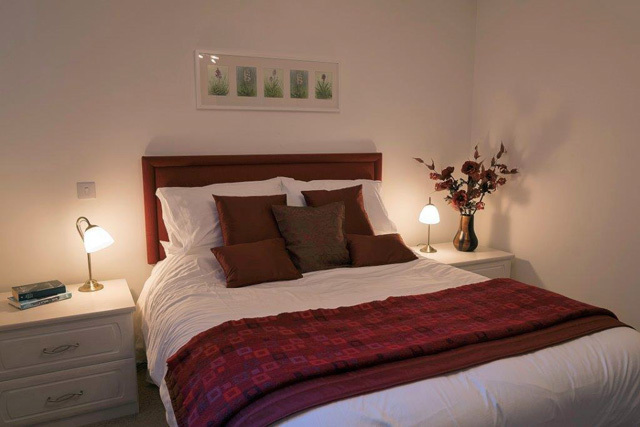 The owner has provided quality bed linens and towels for all guests. Externally the property has a large enclosed garden, complete with an area of patio, and private parking. Please note a small stream does run through part of the garden. 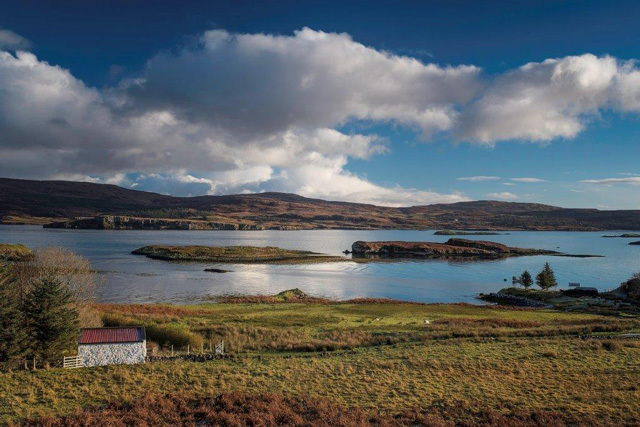 Just a short walk from The Orchids is the shoreline of Loch Dunvegan, ideal for all ages whether exploring for sealife or perhaps a spot of canoeing or kayaking on the loch. The house itself is very much an eco build, and uses the latest green technology such as solar panels, under floor heating, and a core heating system, which is fitted throughout the house. This ensures that all the rooms are kept at an ambient level no matter what time of year you choose to visit. 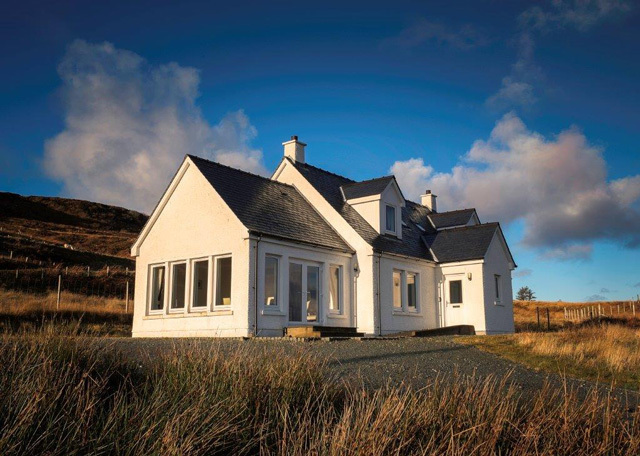 Colbost itself is best known for the Three Chimneys Restaurant, which is located within walking distance from the property. Listed as one of the “World’s” Top 50 Restaurants, it is an ideal place for a special occasion. 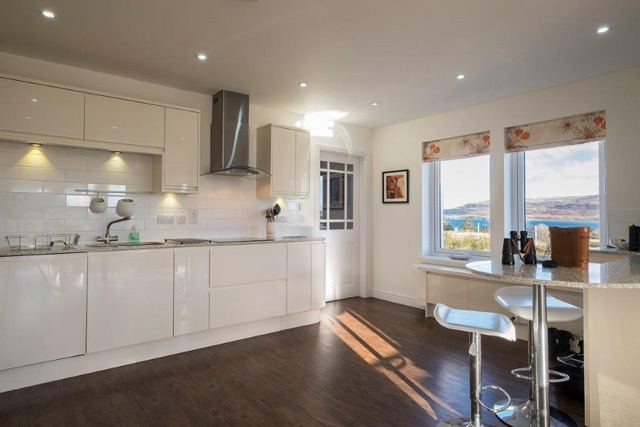 Dunvegan is situated just five miles from the property and has a small selection of shops, cafes, and restaurants, including the popular Old School Restaurant, and a tourist information centre. Whilst here a visit to Dunvegan Castle, the oldest inhabited castle in Scotland and the ancestral home of the Chief of the Clan MacLeod, is highly recommended. In the opposite direction Glendale has a small shop and the Red Roof Café, further on Neist Point with its lighthouse offers some of the most spectacular scenery on the island, and the opportunity to spot sea eagles, golden eagles, basking sharks and whales. 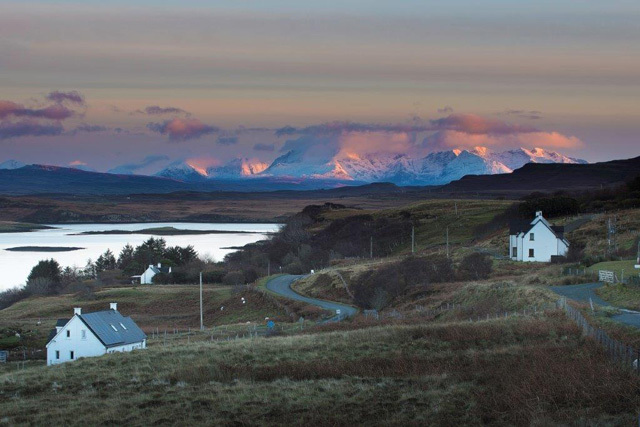 The island offers much for the visitor no matter what your outdoor pursuit, for walkers the twin peaks of the Macleod’s Tables are not far away, and the quiet country roads are ideal for the cyclist. For the lover of whisky the island has its own distillery, Talisker based at Carbost. A visitor centre is based here and tours are available. Throughout the island you will find many small shops and companies providing a wide range of locally produced goods such as art work and jewellery, ideal for picking up a reminder of your stay on this amazing island. 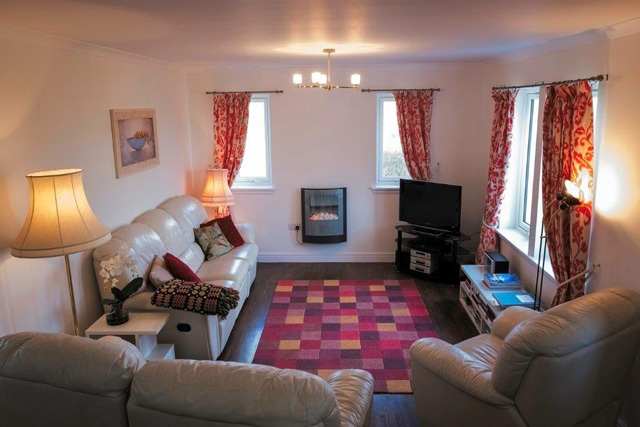 Sitting room, leather sofa and armchairs, desk area, electric fire, Flat screen Smart TV with access to Freeview, On Demand programmes & Netflix included, DVD, CD, radio. Dining room with table and seating for six, french doors with access to the garden. 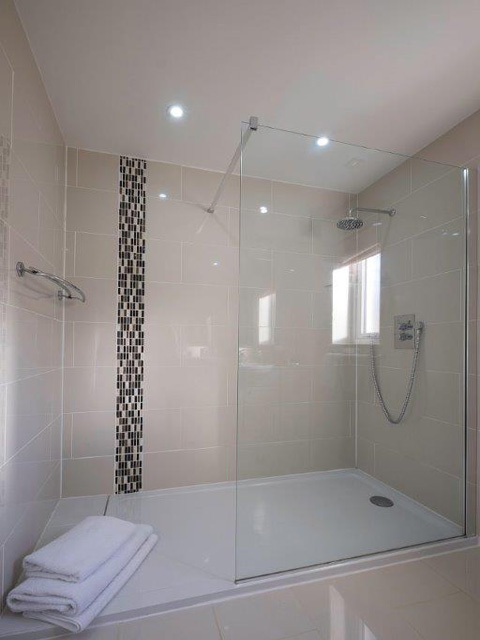 Shower room, large walk in shower, whb, wc, heated towel rail. 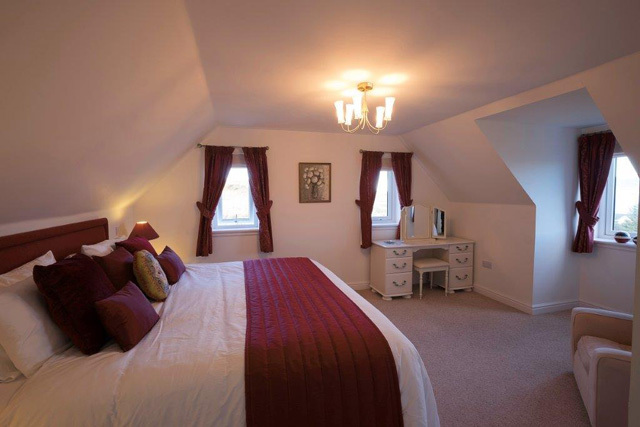 Master bedroom with super-king size bed, en-suite shower room, corner shower, whb, wc, heated towel rail. 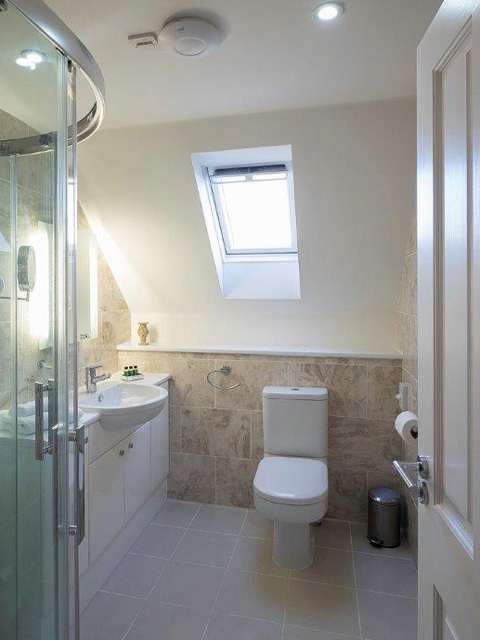 Twin bedroom with en-suite bathroom, bath, whb, wc, heated towel rail. 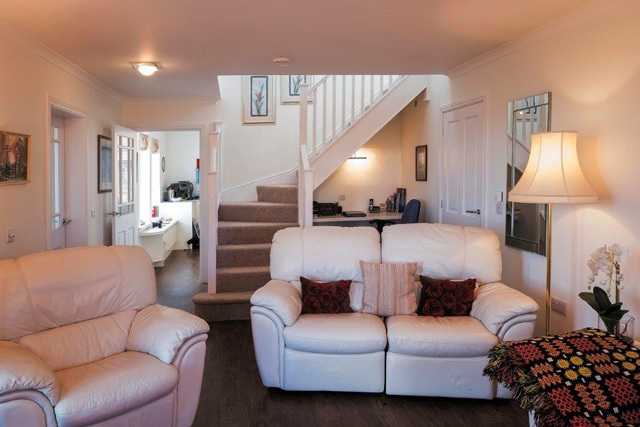 All electricity and heating costs, underfloor heating downstairs, radiators in upper level. Large selection of books and games. Enclosed garden, garden bench, please note a small stream does run through part of the garden. Beautiful property furnished and equipped to an extremely high standard. Fantastic coastal location with magnificent views. Just a short distance from the Three Chimneys Restaurant.